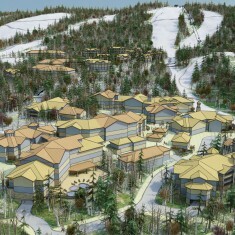 Mont Cascades | Mont Cascades | Ecosign Mountain Resort Planners Ltd. 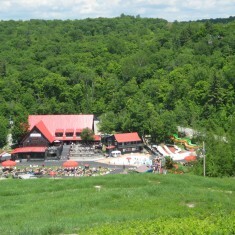 The Mont Cascades Resort is located on the eastern shores of the Gatineau River in the Province of Quebec, approximately 20 minutes north of downtown Ottawa. 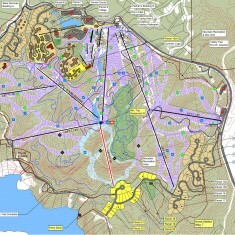 In January, 2010, Ecosign prepared a Resort Area Master Plan which provides a definitive guideline for the continuing renovation and future development of the resort. 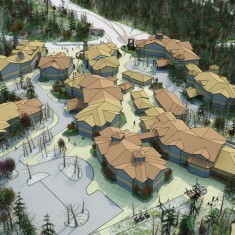 The ski resort will utlimately include a total of eight ski lifts, a learning center with five moving carpets, and a pulse gondola/cabriolet to transport guests from the day skier center located at the base of the mountain to the upper accommodation area. At buildout, these lifts will accommodate approximately 4,350 skiers per day and the ski terrain will cover approximately 48 hectares of ski trails. Land use designations, conceptual building locations and parcel outlines have been assigned to the development zones. All accommodation will be either ski-in/ski-out or within a comfortable walking distance of a lift or ski trail. The focus of the resort is a pedestrian mountain village with a ski-in/ski-out location, on a southwest facing plateau at the 168 to 180-meter elevation, that includes a mix of private and public accommodation with commercial space for residents and visitors such as meeting and conference facilities, a public spa and a variety of retail shops along a pedestrian street that ends with a large mountain plaza at the south/southwest facing snow front. 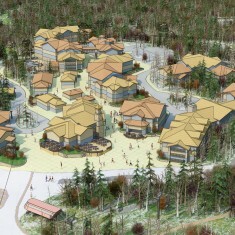 The village is linked to the main base and the day skier parking lots with a pulse gondola that allows visitors and residents to move around the resort without using their car. The Master Plan allows for approximately 664 units containing 3,822 beds.